Trucks are everywhere in Texas. This is true even during times of high gas prices, though I’ve heard that sales of trucks are down. 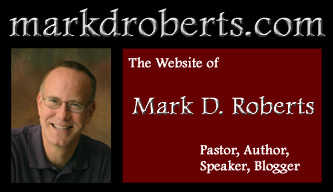 For most of us, trucks are a means of transportation along paved roads. But some folks actually use their trucks as, well, trucks! They drive on dirt roads and no roads, hauling ranch supplies or animals they have shot in the woods. 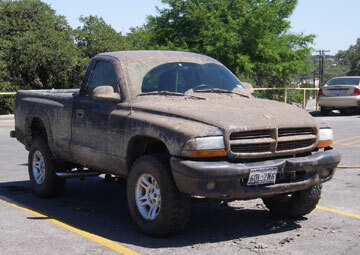 As you might well imagine, sometimes trucks used for such offroad purposes get a little dirty. The picture to the right, taken in my local HEB grocery store parking lot proves the point, don’t you think? Then I came upon some even stranger in my local Home Depot. The display was ordinary enough, a bunch of cans of pruning seal. If you’re not familiar with this stuff, it’s a black, spray-paint like substance that you use when pruning. By covering a pruned area with pruning seal, you keep bugs from hurting or killing the recently pruned bush or tree. But, as it turns out, there are other uses for pruning seal. 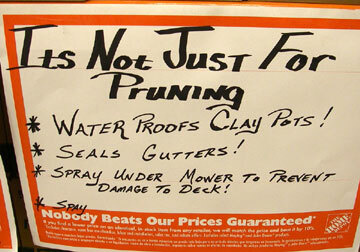 As the Home Depot sign says, “It’s not just for pruning.” What else can you do with pruning seal? 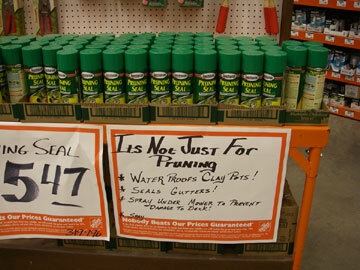 You can waterproof clay pots, or seal your gutters, or spray under your mower to protect the deck. And . . . you can spay! That’s what the sign says: * Spay. As in, “You need to spay your cat.” Or “Is your dog spayed?” I looked up definitions of “spay” just to see if there was some other meaning I had missed. “Spay” is the name of a three-year-old male red deer. (Seriously!) But the basic meaning of “remove the ovaries” of an animal is the main one. Now I’m not quite sure how you’d use pruning seal to spay your animals. And, frankly, I don’t want to know. Now you might think that the Home Depot sign was simply wrong, a result of human error. Maybe the sign maker wanted to say “Spray” and didn’t get it right. But that particular sign was up in my Home Depot for at least two weeks. Nobody made an effort to do a new sign or to cross out “spay.” So, all I can conclude is that pruning seal as a veterinary use that I did not anticipate. Only in Texas . . . . The truck photo reminds me of a former co-worker who went off-roading with several friends each year, as soon as spring run-off (of snow) was finished. They drove specially prepared pickups or SUVs that looked much like the one in your photo - large wheels and tires, raised suspensions - but also had special engine equipment that allowed them to drive in deep water. This is included waterproof ignition equipment and vertical exhaust stacks, much like you see on semi-tractors. Too bad I don’t have any pictures to send you. The few shots I saw of trucks up to their beltlines in muddy water were impressive. I am enjoying watching your transition to a different culture. My wife and I recently moved to Scottsdale, Arizona and we are certainly experiencing a few shocks ourselves. I am told by locals that nearly 45% of the residents of Arizona have hand guns in their glove boxes. I was warned to never flip the bird to an Arizonan. Not that I would anyway. I also met, a while back, a woman who each time she goes into the grocery store, straps on her pistol and holster. I haven’t witnessed this, but certainly a far cry from what I am used to. It is clear that the wild, wild west still lives in the heart of Arizonans. You simply MUST go and ask the people at the home depot what that meant. I have to know. I think a follow-up post is in order. real live: I noticed recently that, after several weeks, there was a new sign without *spay. My guess is that it was a mistake. Should have been *spray [something]. But for some reason they didn’t correct it right away. I’m sorry it was gone. I would have asked for you, so you could use that stuff to keep down the animal population in your neck of the woods.